Deputy Rey "El Rey" Davalos confiscates a pistol and a rifle from the vehicle of an alleged felon. Methamphetamine, Stolen Vehicle, Firearms, Driver Facing Multiple Felonies, LIVINGSTON, February 18, 2016 - Shortly before 7 am on February 18, 2016, Deputy Rey Davalos with the Polk County Sheriff's Office initiated a traffic stop on US-190 West (a short distance west of the Livingston City Limits) on a white Chevy pickup that was west-bound. The truck had been reported stolen out of New Mexico. Davalos was soon joined by Deputy Teddy Simms (also with the Sheriff's Office). 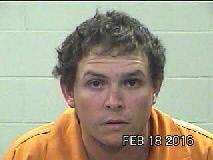 The driver, Aaron Matthew Hill, 25, of Pollok, was placed under arrest for unauthorized use of a motor vehicle. During a vehicle inventory, Simms found a small bag of methamphetamine and two firearms (pistol and rifle). Hill was transported to Polk County Jail and booked in. The stolen pickup was recovered by Ken's Towing and will be stored at Harrison Body Shop in Livingston. During book in procedures, Hill was found to be in possession of a pipe for smoking dope. Possession of this type of contraband in correctional facility is also a felony. Deputy Davalos' encounter with a felon in possession of meth, and firearms in a stolen vehicle underscores the dangers that our law enforcement officers face on a daily basis (are you listening Black Lives Matter? ).